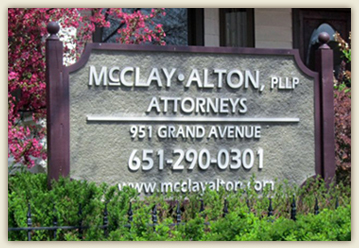 Founded in 1987, McClay • Alton, P.L.L.P., an A-V Preeminent* law firm, provides quality legal services from a convenient location in the heart of St. Paul's thriving Grand Avenue Business District. McClay • Alton is well-versed in providing excellent service to businesses and individuals in a variety of legal fields including: Litigation, Business, Real Estate, Wills and Estate Planning in the Twin Cities, across Minnesota and Wisconsin. For more information, please contact us. *A-V Preeminent signifies that peers rate McClay · Alton at the highest level of professional excellence. McClay • Alton, P.L.L.P. is proud to be members of the St. Paul Chamber of Commerce, Grand Avenue Business Association and Cathedral Hill Business Association. home | robert mcclay | brian alton | litigation | business law | real estate | wills and estate planning | contact us Copyright © 2019 McClay • Alton, P.L.L.P. All rights reserved.